Hello ... Hello ... my old friends ... It's great to see you once again! Question: Wouldn't it be great to see a Roy Wood penned song rightfully back at the top of the UK Singles Chart again? Answer: There is a reasonable possibility of that happening this year due to the recent announcement on Wednesday 23rd October that a charity Christmas single will be released on Sunday 15th December via Universal Music in aid of the ITV umbrella charity Text Santa. In the above article, Roy candidly writes: "Fast-forward to 2013 and I find I’m ready to celebrate the 40th anniversary of the song. I never thought, back in 1973, that people would still be listening to it after all this time. It wasn’t even the biggest-selling Christmas record of that year. Now it’s just been adopted by The Big Reunion for the TV show’s challenge to The X Factor for the festive chart-topper. People from Blue, B*witched, Atomic Kitten, 5ive, Liberty X and Honeyz are teaming up for it. I’m absolutely delighted. From a songwriter’s point of view, it’s always really interesting to hear other people’s interpretation of your music. I’m looking forward very much to hearing their version of the song. I wish them all the very best of luck and success, and hope that this charity campaign for ITV’s Text Santa gets all the support that it truly deserves." 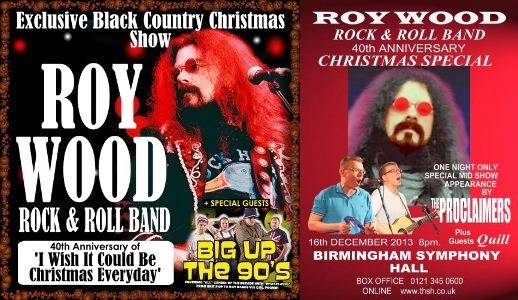 ELO Beatles Forever [ELOBF] recommends Roy Wood to those enlightened folks who enjoy the music of ELO, Jeff Lynne, The Move, The Idle Race, 'Brum Beat', The Beatles and related artistes. I was thinking, "Why? Why not just keep playing the old one. My mates Roy, Mike B's iconic sax rifs.." Then I saw Roy is backing it and changed my mind ��. Gotta be good!! !